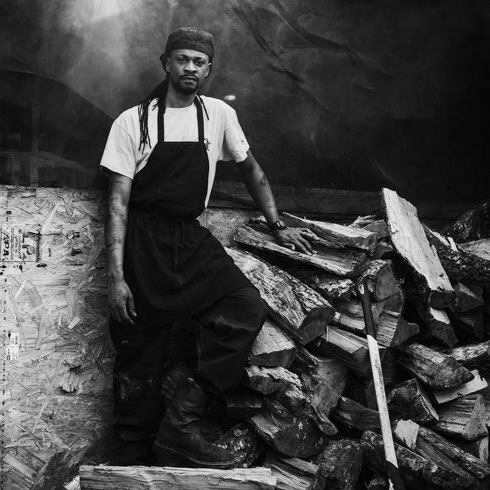 Head BBQ Pitmaster, Bryan Furman, is livin’ the dream having left his day job as a welder to pursue cooking his signature-style pit smoked barbeque, chicken and ribs. What began as a fun idea to celebrate his daughter’s first birthday in 2010 by roasting a hog for family and friends, turned into catering and filling order requests from his co-workers. One night around their family’s kitchen table in North Carolina, Bryan remembers seeking his dad’s opinion on the idea of opening up his own place. His dad liked his enthusiasm but challenged Bryan to think of what might make his ‘barbeque joint’ stand out. Bryan’s reply was to raise local Heritage hogs and to make his own side dishes using locally-sourced, fresh produce with a blend of unique ingredients. B’s Cracklin’ BBQ’s first building on Coffee Bluff Villa Road opened in 2014 but tragically burned in June of 2015. The timing could not have been worse as they had just been named to a Top 50 list of The South’s Best BBQ by Southern Living magazine. B’s had also been featured in the June/July 2015 issue of Garden & Gun magazine’s story on ‘Five Barbecue Joints You Can’t Miss’. Now back in business and humbled by their experience, Bryan and his wife, Nikki, extend heartfelt thanks to some amazingly generous people that have helped to make their return possible.